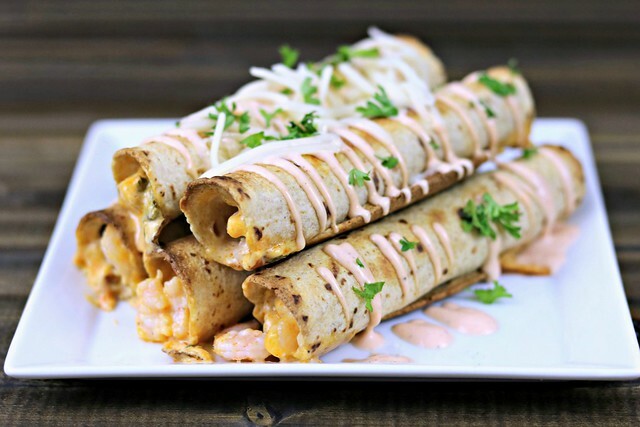 Buffalo shrimp taquitos take shrimp to a whole new level with a perfect blend of creamy and spicy buffalo sauce, rolled up in a crispy baked tortilla. Serve with buffalo ranch sauce for a little extra kick! I haven’t been a huge fan of this “holiday” for as long as I can remember. Not because I was single, but more because it really is a commercial holiday for girls. Like, what do you get a guy for Valentine’s day?? And being the person that likes to give gifts more than receiving them, it just isn’t my cup o’ tea. Give me a sweet card and I’m happy as can be. At the same time, I’m not a scrooge about it. I just don’t want gifts. Cards and cooking a nice dinner – I’m all for that. And now, with Natalie being here, I see holidays of any sort in a new light. Today, for example, we dressed her up in a cute little pink dress with hearts on it, and she wore a pink bow headband. To daycare. Her usual daycare attire? A onesie of some sort and pants. Done and done. But, because it’s a holiday, and it’s a first for her (even if she won’t remember or ever know the difference) we want to celebrate with her in some way. Even if it is just dressing her up a little and buying some chocolates for her daycare teachers. Other than that it will mostly be business as usual at home. The idea of going to a restaurant on Valentine’s Day is not appealing to me at all. The crowds, the wait, the overpriced and mediocre food – no thanks! I’d rather stay right at home with my little family and make our meal myself. And it is Tuesday, so you know what that means, right?? That’s right. Taco Tuesday! And if you know me at all by now, you know how much I love me some tacos. Or taquitos, burritos, etc. Give me a taco, and I’m a happy girl. 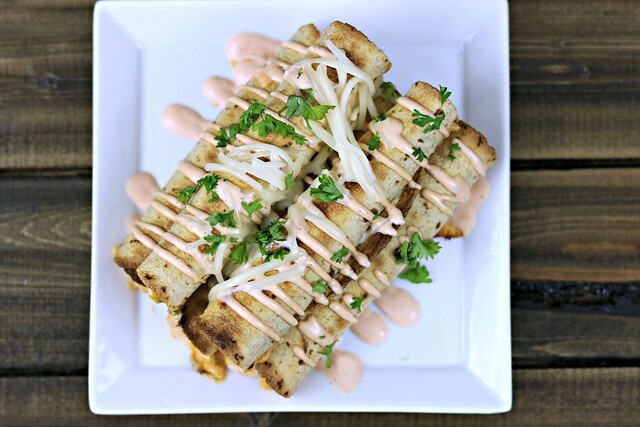 Especially if it involves shrimp and a creamy buffalo sauce, like these taquitos. I’ve mentioned before that J is not a huge fan of shrimp, like I am, so I have to really dress or sauce it up for him to really like it. And since he loves buffalo sauce like I do, these were definitely a big hit. 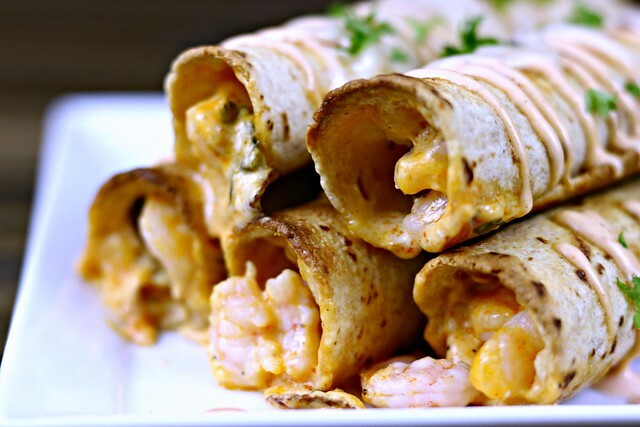 I mean…shrimp, cream cheese, buffalo sauce, and Monterrey jack cheese…all rolled up in a crispy baked tortilla. How could it not be??? And then you dip them in some buffalo ranch…?!?!? Lord have mercy. On your tongue. Preheat oven to 350 degrees F. Line a large baking sheet with foil, spray with cooking spray, and set aside. Heat oil in a skillet over medium-high heat. Season shrimp with salt and pepper, add to skillet, and cook for 3-4 minutes, stirring until just pink. Drain any water that may have collected in the skillet and stir in the cream cheese, buffalo sauce, and Monterrey jack cheese and stir until combined. Spoon 2-3 tablespoons of the shrimp mixture into the center of each tortilla and roll from the bottom up and place on the prepared baking sheet, seam-side down. Spray rolled taquitos with cooking spray and bake for 18-20 minutes, until golden brown. P.S. – I am a HUGE Tex Mex fan and these look so good – my mouth is watering at 9 in the morning!